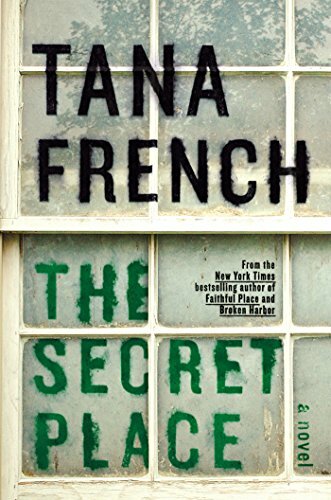 Good Lord, Tana French knows how to write a murder mystery. Every time she releases another title in her Dublin murder squad series, she might as well be putting on a clinic for every other thriller writer out there. The Secret Place is a wickedly fun read, right on par with French's previous four offerings. Detective Stephen Moran is angling for a spot on the murder squad. He's been languishing in Cold Cases, which was a good promotion at first, but now he's ready for the bigtime. And his chance may have just fallen right in his lap: Holly, a teenage girl Moran knows from a prior case, shows up out of the blue one morning and hands him a fresh clue to a year-old murder case. And the clue is a doozy: it's a photo of Chris Harper, a boy found murdered the year before, with the words “I know who killed him” glued on. Holly says she discovered the card on a bulletin board at St. Kilda's, the ritzy girls' boarding school she attends and the place where Chris was killed. When Moran takes this new evidence to Antoinette Conway, the detective who originally investigated the case, she invites him along to follow up at the school. After all, if Holly is comfortable enough to talk to him, maybe some of the other students will open up to him as well. Conway and Moran are quickly sucked into a vortex of teenage girl drama: there are two groups of girls who had access to the bulletin board when the card was posted, and they don't exactly get along with each other. The first group is Holly's own, an incredibly tight-knit foursome; the second (and more popular) clique is headed by the domineering and manipulative Joanne. All eight girls were interviewed extensively at the time of Chris's murder, but now it's clear at least one of them knows more than she admitted at the time. French perfectly captures how it feels to be a teenage girl. Every little emotion is magnified, every tussle between friends has the potential to become an epic battle. Girlhood feels somehow permanent and impossibly fleeting at the same time. Friendships grow like vines, twining even more tightly than family. Boys can wreck everything. And some secrets adults just wouldn't understand. Ok, maybe even I am not that forgetful. But seriously, if you're looking for a unputdownable crime series you won't have to be a slave to, this is the winner. With regards to NetGalley and Penguin Viking for the advance copy. On sale September 2.